The only heat and acid stabilized probiotic that is formulated with a different friendly flora to colonize each section of the intestines - Your Second Immune System. Optimal Flora Plus - provides optimal intestine and immune system support. It is the most advanced formula for intestine support, containing 12 patented forms of STABILIZED friendly bacteria. This stabilized probiotic is unique in today's marketplace because these probiotics can survive the acidity of the stomach so that they can effectively colonize in the intestine. Stomach upset, fatigue, frequent colds and flu, sensitivity to milk and dairy products are some of the signs that your friendly bacterial flora may need to be replenished. The body's flora is depleted by stress, carbonation, laxatives, antibiotics (including those in meat and dairy products we eat) and even the natural aging process. Friendly bacteria are essential to suppress harmful strains that cause bacterial infections and other concerns. Probiotic bacteria "favor life", contributing to health by warding off illness and promoting nutrient absorption. The bacteria strains in Optimal Flora have been shown to support intestinal health, improve digestion, and help with problems of lactose intolerance, and fight back against toxins and infections. Without a supply of approximately 3 pounds of friendly flora in the intestine, we are left without a strong defense against digestive problems, poor nutrient absorption, illness and infections. Helpful flora is called probiotic, meaning, favoring life. Antibiotics are against life, and kill not only the harmful strains of bacteria, but also destroy those strains that we need for health and well-being. Unfortunately, even if we haven't recently taken prescription antibiotics, we still are regularly exposed to antibiotics. Since half the antibiotics produced each year are fed to animals, we take in antibiotics every time we eat meat or dairy products. Other factors, including stress, carbonated drinks, laxatives, birth control pills, coffee, alcohol, and aging also pull from the body's flora supply. Flora depletion is of serious concern in today's environment. In addition to increased toxins, harmful bacteria including highly resistant strains called super germs are on the rise. Optimal Flora Plus, which was developed with input from the world's leading probiotic authority Dr. Khem Shahani is far superior to other flora products in that it contains the heartiest forms of bacteria, proven to withstand the changes in temperature and pH in the intestines. In addition, this unique formula is not a single-strain formula, but contains several strains, each proven to assist with specific concerns, and each adding to the overall effectiveness and value of this product. Improved survival through the stomach and implantation in the lower GI tract - meaning that the bacteria must be able to tolerate and pass through the high stomach acidity AND be able to grow and adhere to the intestinal lining. Where in nature would you find the source for friendly bacteria without the Optimal Health Systems flora supplements? Beneficial bacteria are implanted at birth and will maintain themselves at healthful levels unless the individual is exposed to antibiotics or other toxins. Their population may be reinforced by eating fermented food which are not commercially processed. Yogurt, kefir and miso are examples. What is Lactobacillus acidophilus? This is one of the friendly bacteria that consumes and metabolizes sugars and produces lactic acid. It can be found in some fermented dairy products and nutritional supplements. When acidophilus is consumed in adequate numbers, it populates the intestinal tract and can enhance the state of health. Research has demonstrated conclusively that there is a considerable difference between the different strains of lactobacillus. In fact, the very same strain grown under different conditions will show different properties. This is why DDS-1 is more than simply the particular strain of the species; it is a product of specific conditions of the culture and the processes. L. acidophilus DDS-1 is produced by a unique process that includes growing it in a special medium. It is then mixed with special cryoprotective (protecting against the cold) agents before it is freeze-dried. It is finally stabilized with a specially designed natural stabilizer to protect the microorganisms against moisture, light, heat and humidity. This provides a stability that is unsurpassed to date. Are all Lactobacillus acidophilus strains the same? No. Research has demonstrated that there exist considerable differences among different strains of L. acidophilus. It has also shown that even the same strain grown under different conditions would demonstrate different properties. The DDS-1 strain of L. acidophilus undergoes a unique process of manufacturing that includes a cryoprotectant and a specifically designed natural stabilizer that protects the microorganism against moisture, light, heat, and oxygen. How should probiotics be measured and listed in the Supplement Facts box?All of OHS probiotics are labeled using potency measurements (CFU -Colony Forming Units) rather than weight measurements. The bacteria used in OHS' products were not exposed to methods of forced cell division; rather they divided into new colonies naturally to maintain potency and quality for the consumer. OHS' products containing bacteria are stabilized and guaranteed to colonize within the intestines; hence storage instructions do not require refrigeration. When reading a label for probiotics, look for potency measurements using Colony Forming Units (CFU). Probiotics labeled in weight units, such as milligrams, does not indicate whether or not the colonies in the formula are alive or dead. Why is it important when supplementing with probiotics to select a formula that contains multiple strains? Within your intestines reside hundreds of different strains of bacteria (flora) that promote digestion and form part of your body’s defenses against food borne bacteria and microorganisms. Supplementing with multiple strains of bacteria accelerates the therapeutic benefits of probiotics as opposed to supplementing one stain at a time. If I am taking an antibiotic, should I discontinue taking Optimal Flora Plus in fear that the antibiotic is killing all the strains? No. This is actually the most important time to supplement with stabilized friendly bacteria. Unfortunately, antibiotics kill both pathogenic and friendly bacteria. Remember that friendly bacteria are needed to enhance the body’s immune system by warding off food borne bacteria and microorganisms. A classic example of the body’s immune system breaking down with the use of antibiotics is the onset of yeast infections following treatment. 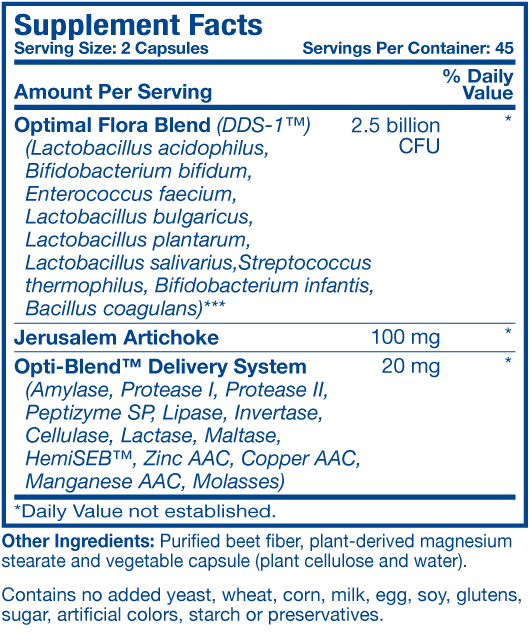 Optimal Flora Plus contains DDS-1 L. acidophilus a strain reported to be highly resistant to commonly know antibiotics, such as penicillin, streptomycin, aureomycin, etc. It is recommended to supplement Optimal Flora Plus before, during, and at least up to two weeks following antibiotic treatment.